Prayer Stations are interactive experiences with Scripture or devotional prompts. A simple, creative gesture can help us slow down and listen for what God reveals. The gesture likewise opens us to respond. For me, utilizing the sense of touch in prayer takes me to a child-like place. I’m reminded of a less complicated time- a time of wonder, imagination, and play. It gets me out of my head and into my heart. I’m often surprised by the ease and depth of God’s interaction in these encounters. 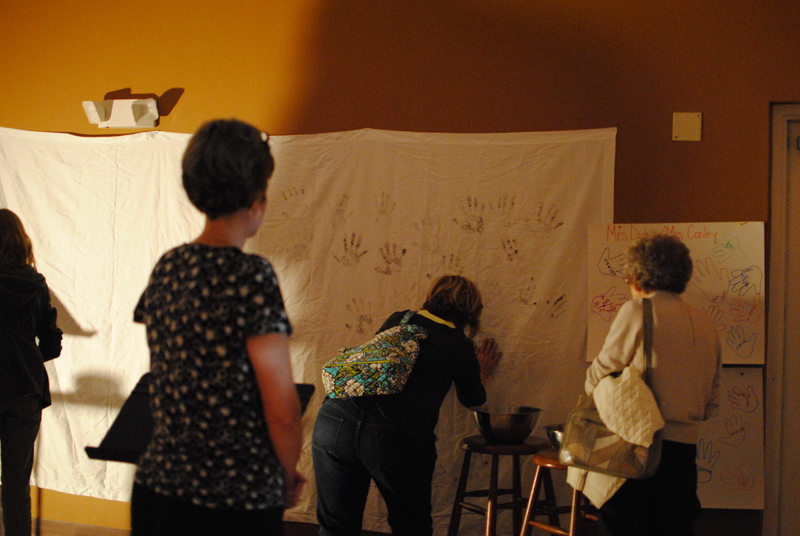 This prayer station was designed for the opening night of a women’s retreat. The opening night theme was “Let it go.” It could be used in many other settings as well. Turn off your phone and leave it in the basket. It will be returned to you at the end of the day. Take off your watch, your Fitbit, or anything else you might carry to measure yourself and measure time. Leave it in the basket. It will be returned to you at the end of the day. Leave it in the basket as you entrust it to Jesus for the time we are together. Wooden statue of Jesus the Good Shepherd carrying a lamb. Framed copy of Psalm 23. • Think about a concern, regret, burden, or sin. Sum it up in one word. • Write that word in the sand. Take your time. • Stay with the word for a moment. • Wipe the word away, accepting the healing, grace, and forgiveness of Jesus. • Repeat as needed with other situations and words. • Take your time. Stay as long as you need. IHS monogram and Chi-Rho monogram, ancient representation of Christ’s name. As Christians we call on the name of Jesus to save us, forgive us, and heal us. Story of the Woman Caught in Adultery and Stone. When we are honest with ourselves, when we claim our universal need of forgiveness and the universal offer of forgiveness in Jesus, we lay down our stones of condemnation and death. Shell, ancient symbol of baptism. We are named and claimed by God in our baptisms. We are all in the same situation. We are all in need of God’s saving power and love. wooden toothpicks. You could tea dye them if you wanted them to better match the wreath. Below you will find several options. Choose one or create one of your own. Whatever you choose, read the scripture first and then pray through the prescribed actions. If you’re writing your own option, be sure to be clear what the gesture represents and what the prop represents. Option 1- The soldiers mocked Jesus without mercy. He understands our pain. Place toothpicks in the wreath for people or groups of people who are bullied, verbally abused, and stereotyped. Be specific. Remove the toothpicks as you pray healing and new life for the victims and their abusers. Option 2- The soldiers mocked Jesus without mercy. He was brutally bullied. Place toothpicks in the wreath as you think about instances when you have been the bully and when you have been bullied. Remove the toothpicks as you ask for forgiveness and extend forgiveness. When the wreath is empty, hold it in your hands as you accept God’s gift of new life and pray for an end to all bullying. Option 4- Place toothpicks in the wreath as you name the various ways Jesus suffered. When complete, spend a few moments in wonder and worship at the depth of Jesus’ sacrifice and love. When you are finished, remove the toothpicks to reset the station for the next person. One half of a medium sized room with medium lighting. (Stations 3 and 4 can share the same room) A white bed sheet or cloth is pinned to a wall. Instructions for station 4a are placed on a music stand a few feet from the wall so people encounter them as they approach the station. 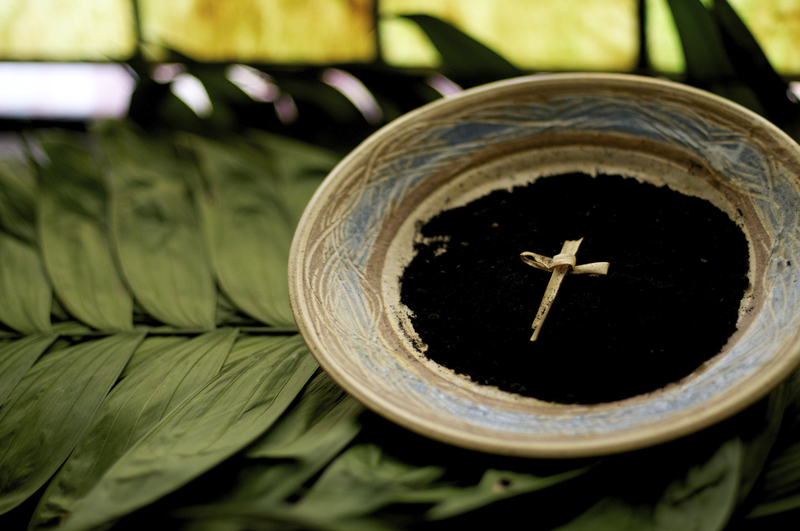 A bowl of water and a bowl of ashes are placed on a small table to the right of the white cloth. (Due to the amount of ashes needed for this exercise, we used ashes from a fireplace for this station rather than ashes made to be placed on a person’s forehead for Ash Wednesday.) Baby wipes and instructions for station 4b are placed on a small table to the left of the white cloth. A trash can is placed near this table. 1. Persons read the following and perform the action for station 4a: For we are what he has made us, created in Christ Jesus for good works, which God prepared beforehand to be our way of life. (Ephesians 2:10 NIV) Remember Who created you and what you were created for. By placing your hands into the water and then into the ash and then onto the wall, you are affirming your desire to join Jesus in bringing hope, salvation and new life to the world. 2. Persons read the following and perform the action for station 4b: Let us approach with a true heart in full assurance of faith, with our hearts sprinkled clean from an evil conscience and our bodies washed with pure water. Let us hold fast to the confession of our hope without wavering, for He who has promised is faithful. And let us consider how to provoke one another to love and good deeds. (Hebrews 10:22-24 NIV) You’ve been cleaned up and given a fresh start by Jesus, our Master, our Messiah, and by our God present in us, the Spirit. (1 Corinthians 6:11 The Message) As you clean your hands before exiting, thank God for this fresh start and invite Jesus to use your hands for good works. Confession and forgiveness, prayer and worship, growth and illumination. The journey with Christ naturally makes its way to joining Jesus in his mission. As I placed my ashy hands on the cloth, I remembered how eager Jesus was to get his hands dirty in saving work: the sawdust of honest labor as a carpenter, the rags of desperate lepers, the linen and spices of dead sons, the bread and fish of a miraculous meal, the salty spray when lifting Peter from drowning, the mud pie to make a blind man see. I see Jesus smiling with a child-like delight while making the mud pies. (John 9:1-41) Our God is holy, pure. Yet God is willing to come down to our level, to be hands on, personal and intimate (how intimate is spit! ), to get messy and dirty so we might be whole. Jesus making mud reminds me of Genesis 2 where God makes Adam (a whole person) out of mud and breathes life into him. (Adam literally means earth man or mud man.) Coming to faith requires remembering we are mortal/dust and in need of God’s eternal love and salvation. Embodying that faith means remembering those around us are also mortal/dust and sharing what we have found with them. Jesus is willing to touch our lives, even though they are messy, oozing, and soiled. Am I as willing? As eager? This station is the fourth of four prayer stations designed for use on Ash Wednesday. They could of course be used anytime when the themes for self-reflection and prayer include our mortality, our sorrow for our sin, and recommitment to living in alignment with God’s holy will.